In the week that President Obama makes a major new statement on US policy towards the Middle East, and prepares to meet Israel's prime minister, Binyamin Netanyahu, the New York Times provided Palestinian Authority (PA) President Mahmoud Abbas with a platform to unveil his new strategy. In his 17 May op-ed article in the Times, "The Long Overdue Palestinian State", Abbas laid out his plan to request international recognition of the "State of Palestine" along the Green Line that is commonly referred to as the pre-June 1967 border – that is, to achieve statehood without negotiating with Israel. Thus, it is his recipe to circumvent negotiations, form a state and retake Jerusalem, without grappling with Palestinian mythology or compromising in any way. In laying out the ingredients of his plan, Abbas reveals that, at the core, the Palestinian struggle is not actually about borders but about Israel's existence. It is the quest for a Palestinian sense of justice at the expense of a negotiated end to the conflict. "In November 1947, the general assembly made its recommendation and answered in the affirmative. Shortly thereafter, Zionist forces expelled Palestinian Arabs to ensure a decisive Jewish majority in the future state of Israel, and Arab armies intervened. War and further expulsions ensued." Cleverly, Abbas has removed Palestinians from the stage of responsible actors. According to him, they played no role whatsoever – they were merely the victims of Israeli actions. Of course, the inconvenient truth is that Israel accepted the partition plan while the Palestinians and Arab states rejected it and, instead, launched a war against the nascent state of Israel. The Palestinian refugee problem – whose fate is central to Abbas's perception of justice – is a direct result of that war. His careful wording, "War and further expulsions ensued," is remarkably passive. Egypt, Jordan and Syria forced the 1967 war upon Israel, while the former two occupied what is today called the West Bank and Gaza Strip. But Palestinians were not then clamouring for an independent state alongside Israel or freedom from Arab occupation during the two decades between 1948 and 1967. Instead, in the wake of the 1967 war, the eight Arab heads of state released the Khartoum resolutions that formally declared: "no peace with Israel, no recognition of Israel, no negotiations with it…" In fact, two more decades would pass before the Palestinian Liberation Organisation (PLO) would recognise, at least rhetorically, Israel's right to exist (but not as a Jewish state), renounce terrorism and accept UN security council resolution 242. Indeed, it took 40 years after Israel's creation for the PLO to make the decision to seek negotiations with Israel, as opposed to openly seeking its destruction. But this game of words was merely a change in tactics; the goal remained the same. "Since 1948, every time we've had something on the table we say no. Then we say yes. When we say yes, it's not on the table anymore. Then we have to deal with something less. Isn't it about time we said yes?" But again, Arafat said no. This is not the Palestinian narrative that Abbas would like to the world to hear because it would mean that as active actors in their struggle either against Israel or for statehood, Palestinians themselves bear much responsibility for their plight. Historical distortions aside, the most telling aspect of Abbas's op-ed in the New York Times is his concentration on the Palestinian refugee issue. Indeed, securing the unlimited return of Palestinian refugees to Israel remains a Palestinian strategic principle, not a negotiating tactic. Abbas begins his article with the story of his expulsion from Safed during the 1948 war. While employing the third person narrative, he explains, "Though he and his family wished for decades to return to their homeland, they were denied that most basic human right." Yet Safed is in pre-1967 Israel and not a part of the territory he currently demands for a Palestinian state. Instead, he is demanding a so-called right of return of an estimated 4.8 million Palestinian refugees and their descendants to Israel, a country with just over 7 million people, 20% of whom are Arabs. In essence, the "moderate" leader of the Palestinian National Authority isn't just asking the international community for a Palestinian state, he is asking for the Israeli state to boot. If this plan sounds familiar, that is because it is the phased approach to Israel's destruction that is currently and publicly endorsed by Hamas. But gaining statehood is not enough for Abbas or his Fatah organisation either. He explains that UN recognition of Palestinian statehood, "would pave the way for the internationalisation of the conflict as a legal matter, not only a political one. It would also pave the way for us to pursue claims against Israel at the United Nations, human rights treaty bodies and the International Court of Justice." So, beyond gaining statehood and strangling Israel with millions of Palestinian refugees, the Abbas plan is then to sue Israel and "pursue claims" in any international forum that will listen. Such motives do not bespeak the "peace-loving nation" that would be a Palestinian state. 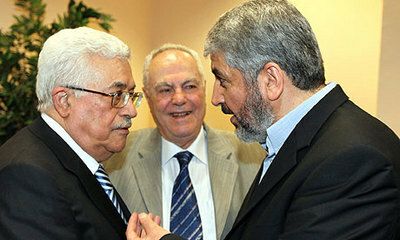 Given both Fatah's and Hamas's long-term goal vis-à-vis Israel, it is no wonder they recently formed a unity government. The fact is that the main difference today between Fatah and Hamas is over the questions of what role Islam should play and the extent to which terrorist bombings, missile attacks and kidnappings should play a part in realising their dream of statehood. And while Abbas may want the US and the west to believe he is serious when he claims, "Negotiations remain our first option," the truth is that it is Abbas himself who walked away from the negotiating table and who continues to refuse to negotiate with Israel. Abbas's unilateral plan makes crystal clear that, for the PA, the issue today is not 1967 and a question of borders, but rather 1948 and Israel's existence. After all, according to the Palestinian narrative as conveyed by Abbas, it is Israel's existence that is the Palestinian nakba, or catastrophe, not the Israeli occupation of the West Bank that began in 1967. If the Palestinians had accepted the November 1947 UN general assembly partition plan, they could be celebrating their 63rd year of independence alongside Israel. There would have been no war and no Palestinian refugees. But that ship has sailed. Contrary to Abbas's plan, today the only pathway forward is at the negotiating table with Israel. And those negotiations are doomed to fail until Palestinian leaders compromise with their own mythology and accept a solution that provides for both a Palestinian Arab state and Israeli Jewish state living side by side in peace.